The general office equipment set up principals are the same for everyone. Writers joke that they are their own corporation—just a one-person shop where they wear every hat. 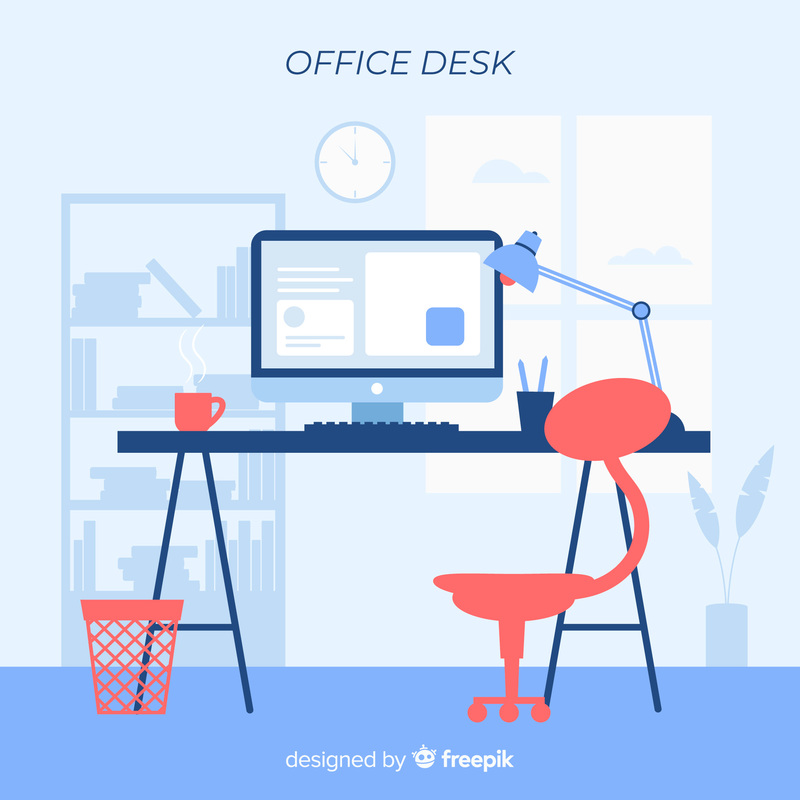 Whether as CEO, CFO, Marketing Whiz, PR Rep, Secretary, Writer, or Editor, we need a work station that is going to actually work—and not hurt us in the process. Sure, you can work for a while curled up in a chair, or walking/running on the treadmill, or lying by the pool. But sooner or later, all the writers I know have had to plop themselves down at an actual hard surface and stay there for a few hours at a time. (If that’s not you, congratulations. Let us know how you manage that.) And to do that, the basics are the same for everybody. Your computer keyboard should be at a height that allows you to reach the keys with your elbows at a right angle from your waist. For most people/desks, this means a keyboard tray—something lower than desk height that slides to get out of the way. The mouse can go next to the keyboard on the same surface. This keeps you from reaching up for the keyboard and straining your shoulders/back. Reality break: If you’re using a laptop, this is a problem. Because the screen is attached to the keyboard, which puts the screen REALLY LOW when you’re typing, and, if you’re using it on the keyboard tray, you can’t slide it under the work surface. There are two initial solutions. First is the wireless keyboard I mentioned in the introductory post in this series. You can use that on the keyboard tray and raise the laptop screen. The other is a separate monitor. I actually combined these into my preferred third option: Both. Over time, I have expanded my desk setup with a laptop to mimic a desktop workstation. And, in fact, use a dual-monitor display. More on that in a moment. The other important ergonomic tip for computer usage is the monitor placement. Your screen should be approximately arm’s length from you. If you divide your screen into three strips lengthwise, your eyes should be level with line forming the upper third of the screen. This keeps your neck straight as you look at the screen. That said, in real life 90 percent of monitors aren’t built like that, and even the adjustable ones don’t go that high. Why? Laziness on the part of the designers? I don’t know. Your monitor will probably need to be raised up a few inches. Which is annoying. I have a great little computer desk I bought years back that has a raised platform on the right-hand corner. It’s an interesting addition that happens to be perfect for raising the physical laptop enough to be close to those specs. I use this as my secondary screen—having it a bit lower isn’t too bad. Over time, I’ve used a number of different easy options for raising my primary screen. The first was the ever-popular Writer’s Market—every writer I know owns at least one (pre-internet) copy that they can’t bear to just toss. It’s about three inches thick, and works wonders for raising the monitor to a perfect height, and looks really writerly if you set it up so the spine faces you. My new monitor has a slightly wider base, so I had to look for a different solution with the recent office renovation. I realized abruptly that the answer was right at hand—I had also gotten a new wireless keyboard. Those come in long, narrow boxes that I always want to hold onto for a few weeks in case something glitches with the electronics. Yes, it turned out this was the PERFECT height for my monitor. But…it was ugly. A quick trip to the fabric box, and I wrapped the box in a piece of colorful silk. My current set up is perfect for me. I have two monitors so I can leave my manuscript up while I do research on the internet on another screen. My keyboard and mouse are the right height, and I’m no longer hunched over my laptop. I can also simply unplug the monitor from my laptop, and take it with me as needed for conferences, meetings, etc., and have all my files with me. The reduction in the amount of aches and pains I suffered while writing was astonishing. Getting an external monitor and keyboard and using them at a “real desk” at the correct heights is the first thing I recommend to anyone I hear complaining about writing-related aches and pains. Side Note: If you’re not aware of it, your laptop can be set up to use external monitor(s) or a mix of the main laptop screen and external ones. You can also set it so that you can keep the laptop closed and it still runs. For Windows, these settings are found under Settings/System, and the landing page is for the Display, with options for Multiple Monitors. I use “Extend this Display,” which links the screens into one giant one. Duplicate this Display does just what it says—puts the same thing on both monitors, which is not useful for my purposes. You can also switch between screen one and screen two and put whatever screen you prefer directly in front of you. You can use a USB connection adapter rather than a VGA connector to add a third monitor as well. The system pretty much sets everything up for you when you plug stuff in. You might have to make a few adjustments to match up the screen display specs. If you like pretty desktop graphics, there are specific desktop backgrounds available for multiple displays in the Windows customization store.